The Emini is coiled up and the two numbers I’m looking at are 2,092 and 2,100. We’ve not been able to bust through 2,100 to the upside and we’ve filled the charts with RAMBO patterns in the meantime. We could well see a big move on Friday or Monday. Recording this video after close of trade, Thursday 19th of February 2015. I hope you’ve had a good couple days trading. So nothing on the website for a couple of days, so I thought I would do a little bit of a run through video. Three things want to talk about. Gold and silver – do that last, really quickly. I want to talk about where we are in terms of daily ranges, because there’s some interesting stuff going on here. And then in today trades we have some nice little setups. Yesterday FOMC day, with the usual shenanigans. Let me just roll through FOMC day for you. So FOMC day, the news comes out, the notes are released at 1 pm Chicago time. And I always say just trade the first 45 minutes, because after that it just goes really quiet and you really don’t get any decent trending moves. And so that was the morning’s trade, the first 45 minutes we were in a really tight range on the 1500 tick bar chart. RAMBO patterns on 1500 – I keep on saying this – RAMBO patterns on 1500 are really significant. You can get some great little trades off these. You’ll see a bunch of RAMBO patterns on the 500 tick bar charts, but the higher the time frame you go up the more significant the signals are. So on 1500, when you see a bunch of RAMBO patterns going off, particularly in this dead zone, don’t go with them. Don’t buy a potential breakout. That’s what the amateurs are doing here. At 10:30 in the morning, a couple of hours before the FOMC notes are released, they’re looking for a trending move. They’re trying to buy a breakout to new highs. It’s not going happen. And then it goes the other way, all of a sudden. There’s two things going on here. First thing they’re getting stopped out of their trade, because it’s going against them and they put their stops a couple of points, one and half points away, that’s the first thing. The second thing is now they’re reversing and thinking: “We’re going to go short and it’ll break down to new lows.” No, it doesn’t happen again, so we back off that, and then go the other way. So, you wait a little bit of a while until the RAMBO pattern plays itself out, but if you see a move going against it like that, you can jump on board. So this is 1 pm and the FOMC notes come out – all the shenanigans go on here. We get blue professional exhaustion bars various divergence, and we rock the other way. And again the RAMBO patterns on 1500 jump up, so they’re looking at this thinking: “Well, we’re going to break to new lows today, blah, blah, blah, jump the board”. No, it’s not got any professional follow through to that move, we back off that and go to the other way and close on the highs for the day. So overnight, the RAMBO patterns, careful of those just because the indicator needs a little bit of time to re-calibrate in the after-hours. They are valid, but I wouldn’t trade on them in the after-hours. You wait for the other trades during the day. We had this, I don’t know what was going on news-wise. Whatever the news release were happening at 7:00 – I’m in my bed at that time. Hawaii time zone, it’s like 3:30 in the morning, so I’m not up for that. But we get this huge range otherwise. This is a really important number 99, 2100 round numbers like that. 2100 is incredibly significant and we backed off it a couple of times – up to ninety nine and a half up here, first time. But, we get this sell off, the pros aren’t going to let the thing sell off straightaway from the after-hours. They’re going to game it up during the day and use the full liquidity of the market. Everybody’s got to be at their desk. All the Pros have got to take big positions. They’re not going to let that move just collapse during the morning session without getting it back up. And here are the amateurs again, going short first thing expecting this thing to the break to new lows. Well, no, it gets caught. There’s two bars here that are really significant. Blue professional down bar, so they’re buying it on that little spike, bang, starts that trending move off and then we have a little bit more here. Remember the blue professional bars don’t happen on this rise here. The professionals don’t have resting sell orders ready to sell into that strength. They’re picking it up on the retrace here. On the retrace they come down, it pushes a little bit lower and bounces straight off that. As soon as we’re breaking above this consolidation zone here, above the highs, these blue professional bars, bang, we’re going higher. You know that that’s a good little signal here the blue professional bar, we bank off that, because we’ve got the RAMBO pattern in the background. Amateurs are going short, the pros have bought that little dip, because it breaks the highs and keeps on going. They buy that little dip, break the highs, keep going, bang, we’re off to this move to the upside. So that for me was my best trade of the day. What was I doing? I was long 91.50 out at 96.00 for four and a half points, which is a really nice trade. It went higher. I was getting out just at this RAMBO pattern blue professional bar. It went the full deal, pullback end of trend exhaustion bar in bearish division. Started to rollover and then we’ve had this move down where we can’t get through this 2,100 number. So remember those RAMBO patterns. Remember that full liquidity of the day comment I always talk about. Before a trend change the pros are going to put that move in during the day. It’s not going to just fall off from the get-go. What about this consolidations zone? We’re in an incredibly tight range. For me the two numbers that are absolutely critical are 2,092 and 2,100. So we’re winding up and winding up. We’ve had very tight ranges very small volumes, lot of churning going on, and I’ll show you on these charts. We’re wound up for a move. And I’m surprised 2,100 has not been hit to the upside, because there’s got to be lots of stops sitting up there that will be really fun to game up through if they’re going to take it down after that. So I’m surprised we’ve had this exact double top here at 99.50, but they’ve not pushed up through there. Maybe they’ll try tomorrow. Tomorrow’s Friday. Fridays tend to be bullish, tends to be rangy. If we did break it up through 2,100 and surprised a lot of people we’d have to jump on board and potentially it could end up being a burst to the upside. But, so far we have not and so we’ve seen a lot of consolidation activity on the 2,100. And so on the downside, for a downside break, 2,092 will be an interesting number on the way down. I think something might be driven out on news events out of Europe that might force this either way. So wait and see. But let me show you this coiling up activity on a couple of charts. So first all, Better Volume, which is a nice free indicator. There’s a whole bunch of blue professional bars in there. Better Volume’s blue professional bars mean high volume churn. High volume churn is we get relatively high-volume and relatively low range. And what that means is the range is being compressed, because we have a lot of selling happening usually at highs. If you see this on the bottom, on the lows that’s a lot of buying coming in at lows compressing, pushing up the low. If the high is being pushed down it’s because selling is coming compressing that range. So we got a combination over the last five days. Three high-volume churn bars, two low-volume bars going on here. So that’s really winding up, we’re really winding up compressing there, in terms of what’s happening. We’ve got sick or resistance in due on the daily chart as well. It’s signalled on some of these daily charts and so just wait for that. On the indices, we’ve got the same thing going on all the time, so this is the Dow chart. 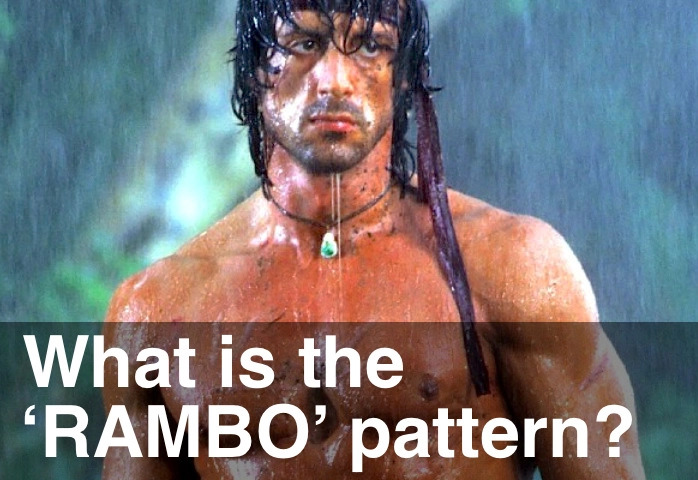 Whole bunch of RAMBO patterns. Whole bunch of amateur bars up here. And just look at these. This is what happens previously. RAMBO we sell off. We can break a little bit higher, but it does lead to some weakness afterwards. So whether we get a little bit of a jump up through this 18,000 will be key number on the Dow, and then sell off something like that, or do we happen to know to the next couple of days. I’m not sure, but those for me are those key levels. This is a 7,500. Same thing RAMBO up here, you see RAMBO at these highs. So we’re getting into that zone where we’re finding it difficult to push through. NASDAQ’s been super strong, but again we’ve come into these RAMBO patterns right here, so RAMBO, RAMBO, RAMBO. All these things going on. And here’s the rustle. Same deal, triple RAMBO going on here. So you see RAMBO, RAMBO, RAMBO. So just be careful. So just to see how this turns out over the next couple of days. When I back it down to the daily chart coming up with the 45-minute chart. There’s that little cyclical resistance that’s printed in there with RAMBO patterns on the Emini on the daily charts also coming up to a pull back to end on trend on the 45-minute chart. So again, a topping out activity. I’d like to see more professional blues bars. If this was a real sell off that was the professionals taking a lot of profits at the highs. I still have a fairly bullish view on equities medium, longish term. But, we could get a sell off from this activity because it’s being driven by the amateurs at these highs. Scared into a nice really deep sell off from which the pros will step in again. I don’t see this as professional profit taking at the highs in expectation of trend change into the lows. All I’m seeing is this could run out of steam cause it’s all amateur activity and low volume activity at those highs, that could lead to a short chart sell off from which the amateurs are scared out, the pros step in and we move back up to record highs. So that’s what I’m thinking is going on. Last couple of charts on here. This is the adjusted TRIN. Not talked about the TRIN in a long, long time. The TRIN system has been regaining. We had record highs last year, in terms of equity curve and then it dropped off quite nastily. But we’re almost back up at those record highs. So just shows the strength of systems if you can’t stick with them. TRIN is showing negative. This is the Better TRIN indicator. This is the adjusted TRIN where I take the normal TRIN numbers, swap them upside down so negative TRIN values are really selling. So although the last couple of days have been up bars, up days, within there there’s quite a lot of weakness, cause the adjusted TRIN values are negative. Then valuation versus oversold. This is versus bonds, so this is the bond oscillator. TLT versus SPY. So equities versus bonds were overbought, again. Overbought is colored with white bars up here. You can see overbought, oversold, overbought, oversold, oversold, overbought, oversold, and so on. So overbought at the moment. Same oscillator used with the Yen for the carry trade. Yen versus equities. Same deal. Oversold overbought, oversold. We’ve got a little white bar up here. Just showing us overbought at the moment on the oscillator. So what else have I got to show you? And the 40,500 tick bar chart. We’ve done pull back to end the trend. This is very similar to a 45-minute chart. Exhaustion bar, bearish diversions, pull back to end of trend. Blue professional up bar over the last couple of three day on these highs here. Finding it difficult to get through 2,100. So there we go. That’s my view on this tight consolidation zone. Ninety-two on the down side for a break could get quite nasty if we break 2,092, but equally we could just go game some stops up above 2,100. They’re just sitting there, and this’ll just be an easy blow off trade, so we just wait and see. Just with these moves, just wait and see and take the signals into your day. But it’s an interesting recoiled up. Basically that’s the story. And lastly gold and silver. And I was saying gold and silver, we’d had a nice little pop daily chart here, you can see, versus the weekly chart, and we had all these blue professional bars breaking out potentially into an uptrend, but I said wait. This zone, these blue professional bars, as we come back in to test that zone, do the pros step in? Do they hold at those within that break out zone and then push it up into a proper up trend, or not? And no. We did not have that. We’ve broken into the lows of that zone. And so we’re looking weak again on gold. We’re going to have to retest this bottom and find the next leg out. So it looks like the pros were using that to get out. The silver, similar type position here. Here it looks more like a u-turn. So daily chart versus the weekly chart. We got blue professionals up bars that are taking profits on the way up and then chasing it on the way down. And then we got another blue professional bar on the way down here. If we break the lows of that over the next couple of days, on silver blue it’s 16, that’d show they were selling it down, selling it down. We’re going to have to go test again back into this 15-zone in order to find that support. This breakout zone, they did not hold it. We look liked we might have got a hold of it a few days ago here coming back into it, but then we’ve broken down through that low of that sequence there. So that whole sequence there was not enough to stop us on the down side. We don’t have a confirmed breakout on gold and silver, so we’re just going to have to go test those lows and see where they go. So there we go, coiled up like a spring. Let’s look for that break that’s going to be strong. Either happening on Friday or on Monday, I’d guess. And then, yeah, just look for good little intraday trades and hope your trading is going well.